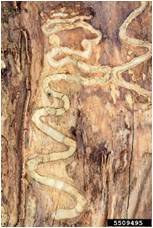 Emerald Ash Borer is an invasive beetle that feeds exclusively on ash trees, often causing tree death within 1-3 years of infestation. Weak and dying trees are at risk of falling on homes and powerlines in residential areas. Ash trees line our streets, shade residential areas, and are in our yards, in addition to the abundance of ash trees in our forests. All ash trees are susceptible and early action is needed. Options include treatment or removal, in addition to monitoring for signs of infestation. The Community Ash Tree Survey is a public database designed to help the community respond to the invasive Emerald Ash Borer (EAB). Using this tool, you can help your community prepare and plan for local infestation. Add your healthy and infested trees to the map and help slow the spread of EAB across the county. Our goal is to track the spread of EAB by closely monitoring ash trees in towns and villages. Every tree added makes it more likely we'll find the next EAB infestation before it causes harm. Many of New York State’s 900 million ash trees are in St. Lawrence County. The map will allow scientists and county administrators to monitor for EAB infestation, implement preventative measures, and remove infested trees threatening nearby infrastructure. Before you go, review ash tree identification below. The survey is simple! All you'll need is a smartphone/tablet, measuring tape, and string. How did EAB get here? Native to parts of Asia, emerald ash borer was first discovered in the U.S. in Michigan in 2002 and has been spreading rapidly ever since. Since discovery of the pest in New York in 2009, it has spread to more than 30 counties across the state. In August 2017, St. Lawrence and Franklin counties were added to that list. 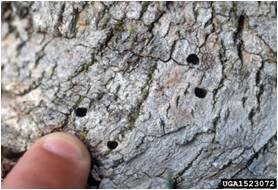 EAB has also infested ash trees along the Canadian border on the northern side of the St. Lawrence River. EAB infestation in St. Lawrence County towns and forests is inevitable, though the extent of current infestation is unclear. Local monitoring efforts through the Community Ash Tree Survey are aimed to help manage and slow the spread. While adult EAB beetles cause some defoliation (leaf loss) by feeding on ash leaves, most of the damage is done by their larva. Larvae (immature stage) feed on the inner bark, making trees unable to transport water and nutrients. 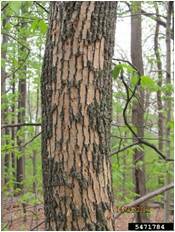 All native species of ash are susceptible, and infestation causes tree death within 1-3 years. There are three types of ash trees in NYS: white ash, black ash, and green ash. Ash trees are widely distributed across the state, with more white ash than any other state! Ash is culturally significant in the region, traditionally used by the Akwesasne Mohawk people for basket making. Its hard, dense interior wood also makes it great for making baseball bats. 3) Bark with distinctive criss-crossed pattern. Communities and landowners are faced with a decision: remove trees pre-emptively to reduce safety risks or wait for the condition of trees to deteriorate (known as the Slow Ash Mortality - SLAM - approach). Dying ash trees are at risk of falling on homes and powerlines. Early action is necessary. By the time signs of infestation are clear, it is too late to save a tree. Participants in the Community Ash Tree Survey contribute to their town’s tree inventory and monitor for infestation. Every ash tree added helps to slow the spread of EAB in St. Lawrence County. After EAB has swept through an area, there are sometimes ash trees that survive despite nearly complete ash mortality, particularly outside of urban areas in more genetically diverse woodlots. Some of those remaining ash trees are even healthy, a phenomenon known in the scientific community as lingering ash. Researchers from different groups are busy collecting seeds and samples from lingering ash in hopes of creating a strong gene pool of resistant ash to protect the species from extinction. Geneticists are at the forefront of the effort to save North American ash species. 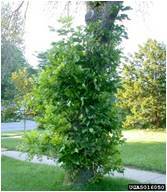 Treatment options are available on an individual tree basis. Please see the compiled list of Certified Pesticide Applicators for more information, attached below. The St. Lawrence County Emerald Ash Borer Taskforce Formed in 2016, the St. Lawrence County Emerald Ash Borer Taskforce is a volunteer group composed of local, county, and state employees, college and university staff and faculty, tree-care professionals and other land-management professionals. The goal of the EABTF is to help communities in St. Lawrence County prepare for the impending EAB infestation. Nature Up North has many citizen science projects. To learn about them all, please visit our citizen science homepage.